Porto Linen PajamasPorto Linen Pajamas, Blue Chambray alt="Porto Linen Pajamas, Blue Chambray"
Print We love lightweight linen for its unique ability to breathe and insulate. 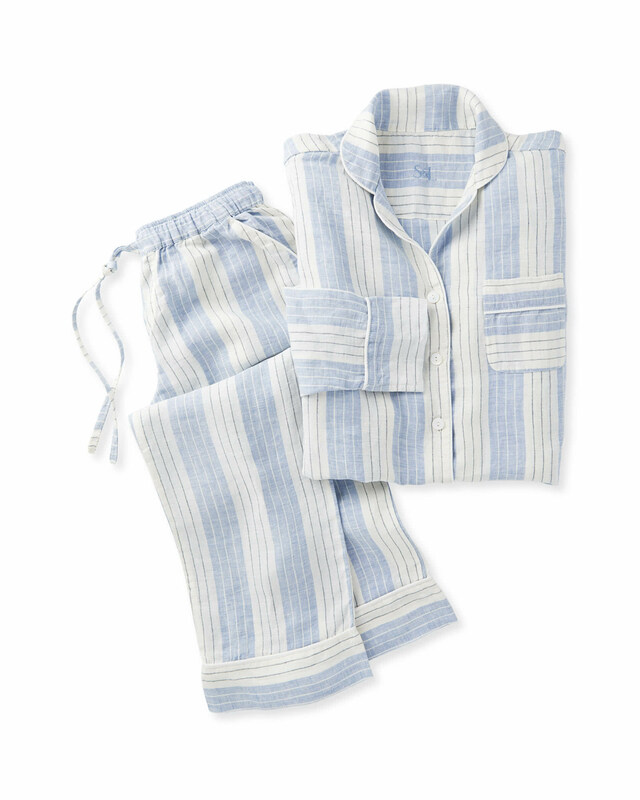 Comfortable and cozy, our PJs keep you cool during warmer months, yet warm when the temperature drops. It relaxes with wear, too, restructuring into shape after laundering (while getting softer with every wash). Detailed with mother of pearl buttons, convenient pockets on the shirt and the pants, and tailored piping along collar and cuff. Wonderfully woven in Portugal and free of harmful chemicals, so it’s gentle on your skin. Woven from 100% washed linen. Relaxed fit (size down for a more narrow fit). Top features mother of pearl buttons. Top hits at hip, approximately 3” below the waist. 31” inseam, floor length on most. Elastic waist with a self drawstring. Women's Sizes: XS, S, M, and L.